KAMPALA, Dec 22 2016 (IPS) - Coffee production provides a quarter of Uganda’s foreign exchange earnings and supports some 1.7 million smallholder farmers, but crop yields are being undermined by disease, pests and inadequate services from agricultural extension officers, as well as climatic changes in the East African country. The International Institute of Tropical Agriculture (IITA), one of the world’s leading research partners in finding solutions for hunger, malnutrition, and poverty, is playing a key role in overcoming these challenges with simple, efficient practices like planting shade trees to protect coffee plants that require a cooler tropical climate. Mujabi Yusuf, 41, a coffee farmer in the Nakaseke District of Central Uganda, told IPS prolonged droughts and unpredictable rainfall had been major setbacks. Uganda has the largest population of coffee farmers in the world, yet 2 percent of its exports are not certified. It is Africa’s largest Robusta producer, accounting for 7 percent of global Robusta exports. The cost of production is low as a result of smallholder farmers using family labour and few inputs. “Seasons have changed and become unpredictable. The rains sometimes come but for a short period. This has resulted in leaves wilting and eventually dying,” says Kironde Mayanja, a coffee farmer from Central Uganda. “Drought stress, pests and diseases, poor quality of inputs, inadequate extension services and financial constraints inhibits farmers from adapting efficiently in Uganda,” says Elizabeth Kemigisha, IITA Communications Officer. “There is a global awareness that if agricultural research for development is to have a positive impact on the beneficiaries of development efforts, all stakeholders in the process need to be on the same page. All stakeholders can all contribute to address the challenges of agricultural development and food security for all,” Kemigisha told IPS. IITA generates evidence-based solutions such as a shade tree tool, farmer profiles and segmentation, new crop varieties, intercropping coffee and banana, as well as appropriate investment pathways for various stakeholders. “Our research is used by non-governmental organisations and the private sector, and we work closely with governments, particularly National Agricultural Research Organisations (NARO). IITA has worked with HRNS as an implementing partner to conduct studies to enhance local knowledge on climate change adaptation in coffee growing,” Kemigisha said. David Senyonjo, the Field Operations Manager in charge of climate change at HRNS, says his organization promotes and provides technical support for coffee production by working with smallholder coffee farmers. “Research has helped to enhance farmers’ resilience to the adverse effects of climate change by providing them with the know-how to adapt to the changing climatic conditions,” says Senyonjo. 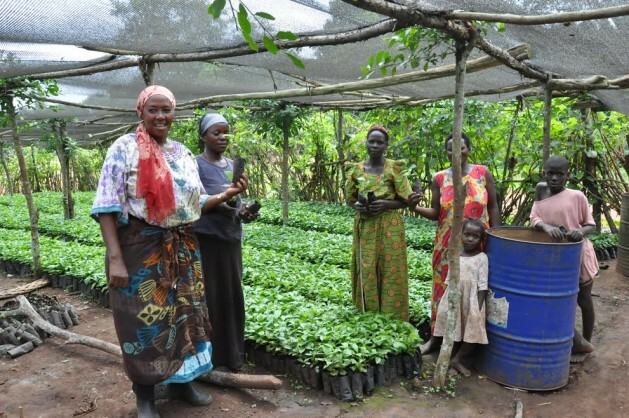 Cathrine Ojara, a female coffee farmer, is one such success story. “The knowledge I’ve received towards adapting to farming that suits the changes in the climate, such as intercropping and planting shade trees, has transformed my life,” she says. Ojara said she has been able to send her children to school and improve her household, as well as establish extra income through projects such as poultry. Mayanja, who has an eight-acre farm, with the help of HRNS Africa has adopted new farming methods and his yields have increased from 20 to 50 percent. “We have received training that has made me an expert in climate change and I have put to good use what I learnt to improve our crops. I have been practicing mulching, planting and managing shade trees, using fertilizers, digging water trenches and irrigation,” Mayanja told IPS. Senyonjo noted that women face additional difficulties. “[They have a] lack of control over production resources like land, which in most cases is a prerequisite to having access to credit, hence women are less likely to use yield enhancing inputs like fertilisers,” he said. “We don’t have our own land and due to time constraints and domestic responsibilities, we are unable to attend trainings on climate change,” Ojara told IPS. While women do most of the farm labor, they only own 16 percent of the arable land in Uganda. Hannington Bukomeko, a scientist with the IITA, said effective adaptation to climate change among coffee farmers requires low-cost and multipurpose solutions such as agroforestry, a practice of intercropping coffee with trees. IITA has developed a shade tree advice tool, offering the best selection criteria for suitable tree species that provide various ecosystems services in different local conditions. “Shade trees are one of the climate change adaptation practice we recommend for farmers. Shades modify the micro-environment so that it reduces the intensity of sunshine hitting the coffee plant as well as evaporation of water from the soil,” says Senyonjo. Bukomeko explained that the tool helps coffee farmers to identify appropriate tree-selection. “Farmers lack the knowledge on selecting the appropriate tree species, lack the tools and technical support to summarize such information to guide on-farm tree selection,” Bukomeko told IPS. According to Bukomeko, the shade tree tool relies on local agro-forestry knowledge and scientific assessments of local on-farm tree diversity. “Users of the tool can identify their location in terms of country, province and ecological zone, select their desired ecosystem services and rank them according to preference. In return, the tool advises the user on the best tree options for a given location and ecosystem services,” says Bukomeko. The shade tree tool was tested and validated for the studied regions, and found to serve the purpose of guiding on-farm tree selection for coffee farmers, according to IITA. “Through government and other partners, the tool can be used by extension workers who will have mobile devices that can access the application tool,” says Kemigisha. IITA has also conducted research on banana/plantain, cocoa, cowpea, maize, yam, and soy bean.